3 bedroom, 1.5 bathrooms,entire home. Includes breakfast and arrival pick up. This jewel of a private home, all to yourselves, is hidden on a narrow, quiet cul-de-sac in the heart of the ancient Moorish city of Marrakech. (Derb Alililj #29, Kaat Benahid, Marrakech, Medina) It is a world far removed, though close to the modern part of town, just a short flight from anywhere in Europe and closer to New York than is London. You will be greeted at the airport or train station and welcomed by our staff upon arrival at Dar Ajiba. From our residential neighborhood it's but a short walk to all of the craft markets (souks), open-air vegetable vendors, several important historic landmarks and one of the finest gourmet restaurants is around the corner. The UN World Heritage Site, the Jmaa el Fna square, always jumping with amazing entertainers and restaurants, is a 15 minute stroll. Though cars are not allowed into the maze of small streets, with everything so convenient a car is unnecessary, and for occasional trips to other parts of town inexpensive taxis are close by. Each morning you will be served a traditional Moroccan breakfast, included in your rate, along with light housekeeping. The house, 1700sq ft (160sq meters) on two floors, has been remodeled in the 'Beldi' style (traditional, rustic techniques), but with many modern comforts added. From the street, the carved doorway opens into a welcoming entryway leading into the terra cota tiled courtyard open to the sky. Surrounding the courtyard, accented by a lovely wall fountain, are the doors and grill-work covered windows of the living room, office, kitchen and 1/2 bath. The living room, with hand loomed Berber carpets has two seating areas. To the right is a classic Moroccan salon with upholstered, carved banquets framed by an antique velvet tent-wall hanging. On the left comfortable leather chairs and hassocks face the fireplace. The office has a desk, fax/phone and a cozy banquet seating area with handwoven Atlas Mountain pillows and rug. The kitchen is complete with modern appliances and granite counter top. The bathroom is accented by a copper sink and mirror with green marble counter top. The second floor has three inviting bedrooms, a laundry room with washer and dryer and a charming full bath, all arranged around the courtyard with carved balustrades bordering the connecting balconies. Each room has a double bed, seating area and wrought iron grill work windows with shutters. The stairway continues up to the roof terrace that provides a spectacular view over the Old City's rooftops to the High Atlas Mountains beyond. A ramada and canopy create shaded areas with tiled table and chairs, and a staircase leads to a small observation deck for a 360 view. In a corner of this walled terrace is a private shower, and a grill work balustrade surrounds the central courtyard opening. As much or as little household help as required is available. Arrangements can be made for a cook, housekeeper, guide/translator (French and Arabic are most useful but many people also speak English). WiFi included. Our local English-speaking agent is available for orientation and assistance. The owner, fluent in Moroccan Arabic dialect, can be reached at any time by phone or email. Marrakech is in south-central Morocco about 150 miles from Casablanca and 100 miles from the Atlantic seaport and beach town of Essaouira. Upon inquiry we can provide suggested reading and references about this truly fascinating country and its culture. Note: Air-conditioned and heating in each bedroom, salon and office/library. Kitchen is open to the courtyard and therefore not air-conditioned or heated. Bring appropriate clothing as rooms are all situated around a central courtyard open to the sky. Air Conditioning in each bedroom, salon and office/library. Kitchen is not air conditioned because it is open to courtyard. Heating in each bedroom, salon and office/library. Kitchen is not air conditioned because it is open to courtyard. Traditionally in Morocco people dine in the salon on around a low table seated on banquettes. Table and chairs are provided in the courtyard and on terrace on roof for outdoor 'western' style dining. Chauffeur - is available for hire upon request. Our staff is available to arrange any excursions, to the Atlas Mountains, to the coast at Essaouira, to the Sahara, etc. Chef - A traditional Moroccan breakfast is included in your rate and will be served daily by staff. Additional wonderful Moroccan meals available by experienced staff. A house mobile cell phone is available for guest use with a small amount of credit included. If necessary more credit can be purchased at most teleboutiques - staff can help with this. We loved the privacy, staff and good location of this riad! Recommend! We stayed in Marrakech for 9 nights, from what 6 nights in this riad (another 3 nights in all inc. hotel). The riad is very nice and authentical. Since you have the all the riad for yourself, its very good for the families (we came with children - 1 and 3 y.). The riad is located in the Medina and its just a short way to main sqare Jamaa El Fna. And dont worry - Moulay Driss will teach you the right way (seems impossible at first but he knows just the right way to teach you by showing you the important signs on the way). I guess Moulay was one of the memorable "things" for us from Marrakech - he is absolutely adorable! He will pick you up from the airport, he will show you around, he will tell you everything about everything, just ask! And he is great with kids - our 3 year old just fell in love with this guy, he was like a grandfather to him, :) really sweet. And more - Moulay and Fatima organized a birthday cake for our daughter, who became 1 while we stayed there! Every morning you get a nice breakfast (a suggestion: a bit of variaty wouldn hurt and also fresh vegetables and fruits - we missed that) and if you wish, they make lunch or dinners also. You can order trips to mountains or to the ocean and Moulay will take you (ofcourse you have to pay for taxi) and be your guide. We went to the mountains and Moulay took us to a lovely tiny village - it was amazing for us te see all this authentic lifestile. One thing that was not so nice, was the carpet shop, that was on the way to the mountains. They (sellers and Moulay also) always say, that you dont have to buy anything, just watch and listen what they tell you about the products. But in this shop, the seller got really rude if we decided in the end that we do not want to buy anything, he just didnt want to understand that we dont want anything! So a note for you, who will go to the Atlas mountain tour - if you dont need a carpet, dont go to this "factory"! And also - the prices are much higher in these shops than in the markets in Medina. For example the argan oil and clay plates-bowls (which we bought from the mountains) - you get the same thing from the supermarket with 3 times lower price! The only thing you get, is that you can briefly see, how its made. In general, Marrakech was really interesting place to visit, we are sad we didnt see more places on Morocco (mostly because of the kids, we didnt want to drive for long hours). The riad and its staff is super nice! Thank you so much. We are happy when our guests are happy. It sounds like you did a lot with the children, I hope all of you will have some memories of Marrakech you can cherish for a lifetime! We stayed late December through early January and enjoyed unseasonably warm sunny weather. The riad is lovely, full of beautifully maintained architectural details. One real plus is the quiet location on a dead-end street - no scooters. Moulay was helpful in orienting us but nevertheless we got lost a few times, which it seems is essential to experiencing Marrakech. Don’t panic - you’ll figure it out, everyone is friendly and helpful, and it’s a great opportunity for problem-solving and teamwork. Breakfasts were varied and well-prepared, served on the roof. We enjoyed the books and diverse music collection of the owners, as there were some chilly nights where we hunkered down with our heaters, and a bottle of wine. Re the latter, Moulay took us to one of the handful of grocery stores where alcohol can be purchased (although very expensive) and pretty much anything else you’d want if you want to do any cooking or just have lots of Happy Hour snacks on hand. You can also buy fruit and nuts from close-by vendors. Moulay helped in many ways, and was a key benefit of choosing this riad. He was there in a few minutes when we had a power outage one night (the entire block went down) and the situation was quickly remedied. In all, this riad was excellent value for what we paid and we will stay here again when I return to Marrakech, which we surely will. Glad you enjoyed our peaceful abode and the neighborhood. Please come back and visit anytime! Our group of friends had a great time. Moulay welcomed us straight from the airport and gave us a perfect local tour to get us situated within the MEDINA with all the local tips. Great city that is safer than most people think. We had a wonderful cooked dinner at home and had a great stay overall. Thank you for your review. Come back and visit again! Perfect place in the medina. Lovely traditional home, comfortable, quiet culdesac, centrally located and very friendly, accomodating staff. Craft markets, important monuments and range of restaurants close by. Couldn't be more ideal. The home is charming, comfortable, clean and ideally located with knowledgeable welcoming staff. Delicious breakfast included and several good restaurants close by. All the craft markets and several historic sites are within a few blocks. Highly recommended! This Riad and the accompanying host/cooks made Marrakesh magical! The accommodations are lovely, safe, clean, comfortable, and perfectly located. Molay, the host, was so helpful and kind, while never being intrusive. He took us to the Atlas mountains and the Palmeria and gave us Souk (market) insights and directions. I've traveled to many countries and I rate this experience as one of the best! Hope to return soon. Wonderful! So glad you enjoyed yourselves! 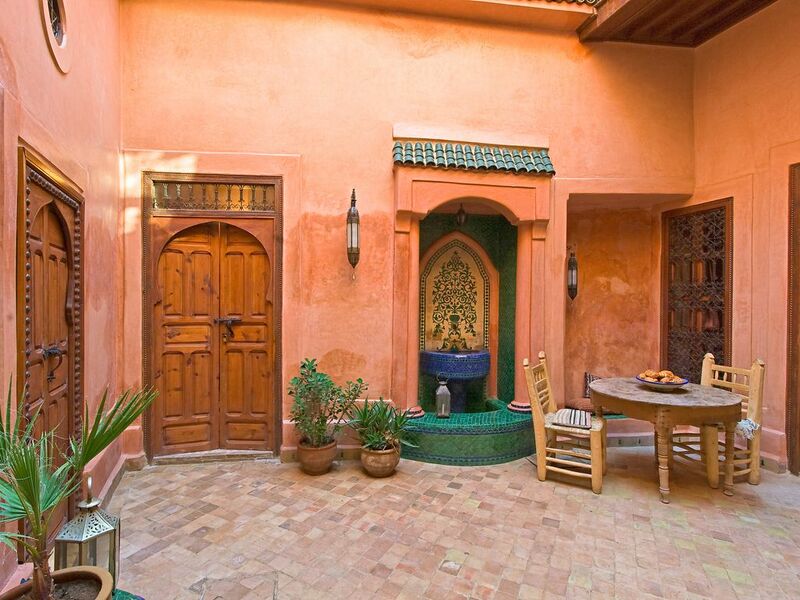 This jewel of a home is hidden on a narrow, quiet cul-de-sac in the heart of the ancient Moorish city of Marrakech. It is a world far removed, though close to the modern part of town, just a short flight from anywhere in Europe and closer to New York than is London. From our residential neighborhood it's but a short walk to all of the craft markets (souks), open-air vegetable vendors, several important historic landmarks and one of the finest gourmet restaurants is around the corner. The UN World Heritage Site, the Jmaa el Fna square, always jumping with amazing entertainers and restaurants, is a 15 minute stroll. Though cars are not allowed into the maze of small streets, with everything so convenient a car is unnecessary, and for occassional trips to other parts of town inexpensive taxis are close by. Marrakech is in south-central Morocco about 150 miles from Casablanca and 100 miles from the Atlantic seaport and beach town of Essaouira. -	Madersa Ben Youssef, an ancient Koranic school/monastery, right around a couple of corners. See our map. -	Museum of Marrakech – the back wall is facing our front door and the enormous canopy seen from the roof covers the interior courtyard. Amazing building and usually interesting exhibits. Nice café too. See our map. -	Bahia Palace – down past the Jmaa el Fna square (not shown on our map, but easy to find) adjacent to the Mellah (old Jewish quarter). Quite fantastic. -	Museum of Photography – Just a couple of blocks away, a few steps beyond the Restaurant El Foundouk Wonderful historic vintage photos, run by Patrick, (US educated) and staff who do an in depth orientation. Great cultural videos always running. See our map. -	Jmaa el Fna square – awesome variety of humanity, always a spectacle, has been happening daily for a thousand years. Walk around, sit in a café and be entertained. See our map. -	Al Yedd Gallery – the selection of jewelry in the markets is overwhelming, but if you are interested in authentic museum quality pieces this is a good bet. On the route to the Square on the far side of the Mouassine mosque. It is owned by Mustafa Ouzid, run by Jawad, prices are fixed and high-end. See our map. -	Samarcand Gallery – also owned and run by our old friend, Mustafa Ouzid, a very erudite, interesting man, fluent in English. This shop is in Gueliz, the newer europeanized part of town. Prices also fixed (very unusual) and up there. Call for an appointment and directions, O668-73-0287. -	Acima - a super market in Gueliz that has about everything, including wine and liquor. Open till 10:00 (liquor till 8:00). Taxi. Marjan is a big-box superstore (“Walmart”). Taxi. -	Essaouira – If you have time, this is a great two or three day excursion to this fascinating historic sea-side town. Have a grilled fish feast at stalls outside the port. Accommodations and car rental can be arranged through Moulay Driss. A comfortable bus leaves frequently from the train station for the three hour trip. -	Chez Chegrouni – on the Square. Reliably good, traditional menu, dh50 – 80. Sit on the terrace for close-up view of the action, or climb to the roof for amazing panorama. See our map. -	Les Premices – also on the square. Recommend the fish tagine, but good for pasta and pizza, too. Dh50-100. Nice 2nd floor terrace. -	Food stalls on the Jmaa el Fna square – amazing to watch scores of vendors set up every afternoon with an incredible variety of traditional dishes. Very tempting to try but cleanliness standards are chancy – definitely avoid any uncooked salads (wise advice anywhere in Morocco, except Dar Ajiba). Some people never have a problem with street food, others, well…no fun getting sick. -	El Foundouk - Our neighborhood place. One of the best in town, lovely atmosphere, roof terrace, lounge, wonderful traditional and continental cuisine, full bar. If you only have one upscale meal, this is our choice. Dh300-500. Reservation recommended, stop by, meet hostess, Hasna. See the map. -	Al Fassia – A favorite also, but a taxi trip to Gueliz. Run entirely by women, charming dining room, fine traditional food. Dh 250-400. -	Cosybar – very cool, trendy place, down near Jewish quarter. Fine for a drink or tea, probably good food, but haven’t eaten there. -	Tangia – a block from Cosybar. Same review. -	Café des Epices – on the spice square, see map. Have coffee, crepes, etc., watch the colorful action. See our map. -	Hotel le Jardins de la Koutoubia – Large deluxe hotel just off the JMF Square (short walk down a small street to the right as entering the square), a lovely, quiet refuge from the markets, with cool bar. See our map. Carriage Ride – A special treat. Lines of carriages parked between the Koutoubia minaret and the Square. Be a tough negotiator beforehand. Should be Dh 200-400 depending on route and time. Possible routes – to Marjorel Garden, Casbah (Saadian Tombs).